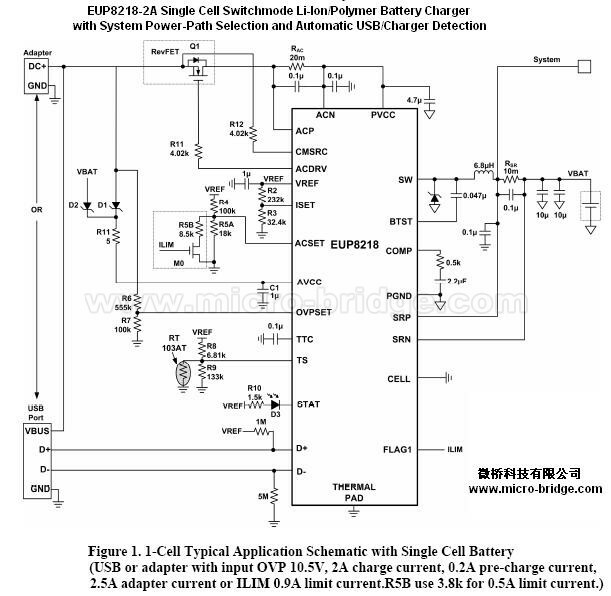 The EUP8218 is a highly integrated single cell Li-ion and Li-polymer battery charger. It integrates a constantfrequency PWM controller with high accuracy regulation of input current, charge current, and voltage. It also provides battery detection, pre-conditioning, charge termination, and charge status monitoring. The EUP8218 charges the battery in three phases:pre-conditioning, fast-charge constant current and constant voltage. In all stages, an internal control loop monitors the IC junction temperature and reduce charge current if the internal temperature threshold (120°C) is exceeded.Additionally, a battery pack thermistor monitoring input(TS) is included that monitors battery temperature for safety charging. Charge is terminated when the current reaches 10% of the fast charge rate. A programmable charge timer offers a safety back up. The EUP8218 automatically restarts the charge cycle if the battery voltage falls below an internal threshold, and enters a low-quiescent current sleep mode when the input voltage falls below the battery voltage. highly-accurate current-sense amplifier enables precise measurement of input current from adapter to monitor overall system power. The EUP8218 is available in a 28-pin, 4mm´4mm TQFN package.